After a bit of a fallow year for gaming in 2015, when I played a lot of analogue cardboard games and MGS V and basically nothing else, I started this year by buying a PS4. I’m in that glorious post-new-console honeymoon period, where I suddenly have a huge library of games at my disposal. So as I cycle through games, I want to try and write about at least some of them. I’ve always enjoyed the Hitman series, but none of its previous incarnations has ever made me swoon like Hitman, the awkwardly-named sixth (depending on how you count) game. Maybe I’m being shallow, and it’s just the lovely graphics. Sapienza in particular is luscious, the kind of Mediterranean seaside resort you wouldn’t mind getting bumped off in. disguise-yourself-as-a-kitchen-assistant-poison-your-target’s-spaghetti-then-kick-them-off-a-cliff assassination a feasible prospect without having to consult an online guide beforehand. Maybe it’s the episodic structure, which I suspect was a result of how the game got made rather than a deliberate design decision, but is nevertheless absolutely perfect. Releasing the game in level-by-level chunks means there’s the promise of a new destination every month, and extra incentive to thoroughly rinse the missions you’ve already got while waiting impatiently for the next to come out. So, for the first time in a over a decade of playing Hitman games, I feel like I really understand the series, for good and ill. The Hitman games pretend to be loose and spontaneous, with hundreds of ways to complete each level, and I’ve been tricked into thinking they’re games of violent improvisation. But that’s not really the case at all. Let’s use one of Hitman‘s coolest new additions to explain what I mean: Escalation Contracts. This mode recycles the levels you’ve already got with a brand new mission that takes two or three minutes to complete. Remember that guard on the left that you just sprinted straight past? Now he’s the target. Once you’re done, it runs you through five increasingly difficult variations on it. This time, you can’t kill anyone but the target. This time, you have to kill this second guy as well. This time, that disguise you’ve been relying on doesn’t work anymore. 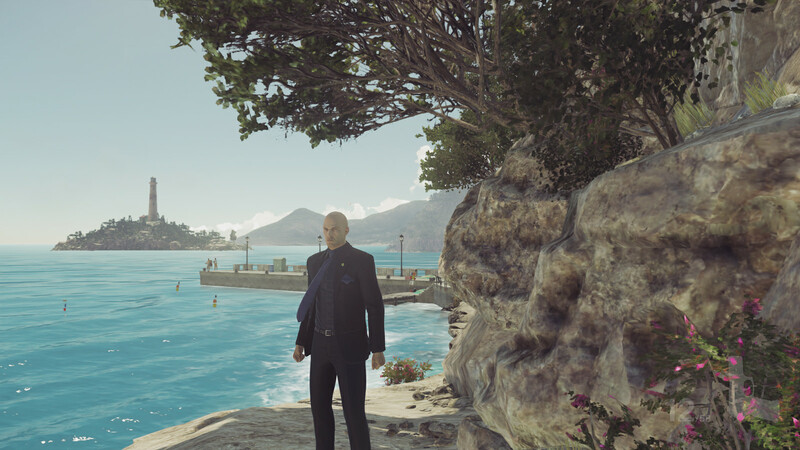 It’s a great way of underlining both the fluidity and the rigidity of Hitman‘s systems. As you level up, you can choose your insertion point, what clothes you’re wearing, what weapons you have stashed in a dark corner of the level. This leads to a cool puzzle, capable of generating some genuine eureka moments before the level even begins. Oh, man, if I start in the kitchen with the poison stashed back there, I can probably do this in no time. Equally, though, once you’ve found an optimal combination and route to success, you’re likely to spend each new variation basically perfecting your racing line. At best, you’re Bill Murray jumping over the puddle in Groundhog Day, Tom Cruise shooting aliens without even looking in Edge of Tomorrow, Keanu Reeves seeing through the Matrix to the underlying code. At worst, you’re living through the bits they cut out of those movies’ montages, screwing up one tiny moment in that combo chain and endlessly reloading the same thirty seconds over and over (to ratchet up the tension, you can’t save at any point during these Escalation missions, and have to start all over every time you fail). This is exacerbated by some truly atrocious loading screens, which involve staring at a vaguely animated map of the world for up to a minute. Mess up the first couple of seconds a few times and you’ll quickly spend more time in this dull geography lesson than actually playing. All of which exposes the mechanisms beneath game’s shiny (oh god it’s so shiny) exterior. Hitman is set in a world world which revolves to a hilarious degree around the player. Practically every other male character is bald, and/or wearing a hat, and roughly the same dimensions (not to mention skin colour) as Agent 47, so that you could easily pass for that person with a simple costume-change, probably after garrotting them and dumping the body in a freezer. This is something the game actually pokes fun at in its training levels, which are constructed out of cardboard and plywood and where you’re assured all of your stabbing/poisoning/ejecting is completely harmless. It’s a reminder that this is an artificial environment created for you to muck about in. So, no, Hitman isn’t the game I once thought it was. I remember criticising mobile spin-off Hitman Go for trapping the player on rails, which I saw as a fundamental misunderstanding of a series where the whole point is choosing your own approach. I was wrong. Hitman isn’t an organic homicide simulator. It doesn’t reward experimentation, except under very strict lab conditions. But you know what? That’s fine. In exchange, Hitman offers gorgeously deep levels, and it’s hugely rewarding to learn the whirr and tick of their inner workings. In the process of grinding out the perfect stealthy walk down a corridor, you might suddenly notice a speedboat parked up outside an open window, or a poisonable glass of wine that had passed you by the first six times, unlocking a completely different set of clockwork mechanisms that lead to you drowning your mark in a toilet rather than dropping a light fixture on them. Often, though you won’t be able to do anything with this information until the next time you play through this level, or by switching over to a different mode. So you do, this time spotting it’s possible to scale that clock tower on the square – but to do anything about it, first you’ll need to keep playing and unlock the sniper rifle. And you do, starting over and over again and finding more and more ways to dispatch your targets until you know the nuances of this simulated town almost as well as that bloody loading-screen atlas you’ve got burned onto your retinas.